The 2013 MLB All-Star Game is complete and the umpiring results are in. Consistent with ESPN's study finding only 1.3 calls per game were close enough for instant replay review, the 2013 All-Star Game contained two such calls. The closest call of the night, Vanover gets right. 1: In the bottom of the 4th inning, Pirates center fielder Andrew McCutchen's stole second base off Mariners pitcher Felix Hernandez and Twins catcher Joe Mauer. 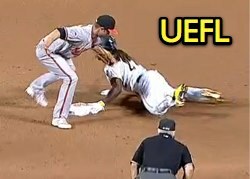 Replays indicate the tag by Orioles shortstop J.J. Hardy was tardy, McCutchen's left hand touching the bag prior to the tag for a correct safe call by 2B Umpire Larry Vanover. QOC = Correct. 2: In the 5th, Hardy beat out a Troy Tulowitzki throw at first base on the backend of an attempted double play. Replays confirm 1B Umpire Wally Bell made the correct call. QOC = Correct. Hon. Mention: In ASG comedy, we had Prince Fielder attempt to high-five (or low-five) 3B Umpire Paul Emmel after his ninth inning triple. Replays indicate the excited Prince missed his mark with the palm, but not with the funny. Stay tuned... 7/17/13 is the Triple-A All-Star Game, featuring HP Umpire Tripp Gibson (PCL), 1B Umpire Chad Whitson (IL), 2B Umpire Chris Segal (PCL) and 3B Umpire Brad Myers (IL). His called strike accuracy doesn't surprise me in the least after watching last night. It could just be my NL bias but it seemed to me more of his calls were in favor of the AL. Agreed, though a 68% accuracy rating on called strikes is a little bit troublesome. Hirschbeck's always had a huge strike zone. The maps are no surprise at all and shouldn't be a surprise to any of the players, either. Any chance we could get a post with some mid-season ejection stats? Which umpires have the most ejections thus far, which have the most points, which MLB teams have the most ejections etc. I'm also curious about which umpires have zero ejections so far. That's always an interesting list. I got 3 more. Hold on. But this is is by far the worst. Well, Oakgrove1 posted all the proof I need that it wasn't my NL bias!